The care and quality of the craftsmanship lavished on a box such as this is a testament to the high esteem in which the objects and utensils for writing and painting are held in both Japan and China. 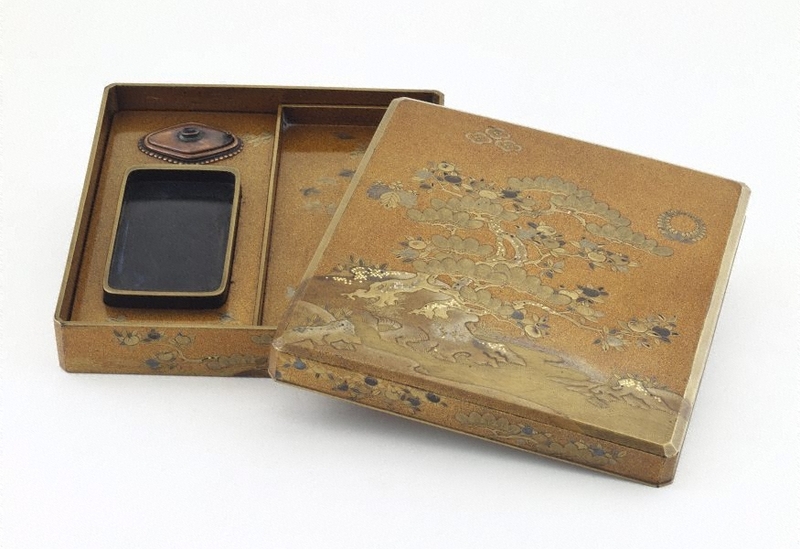 The practice of using a smooth dark stone moistened with water for rubbing and preparing the solid ink was introduced from China; however the elaborate box with its partitions for brushes, ink sticks and a water dropper is more in keeping with the Japanese tradition. The lid is ornamented with a design of pine tree with pomegranate; the inside with a stylised fishing net and bird pattern. 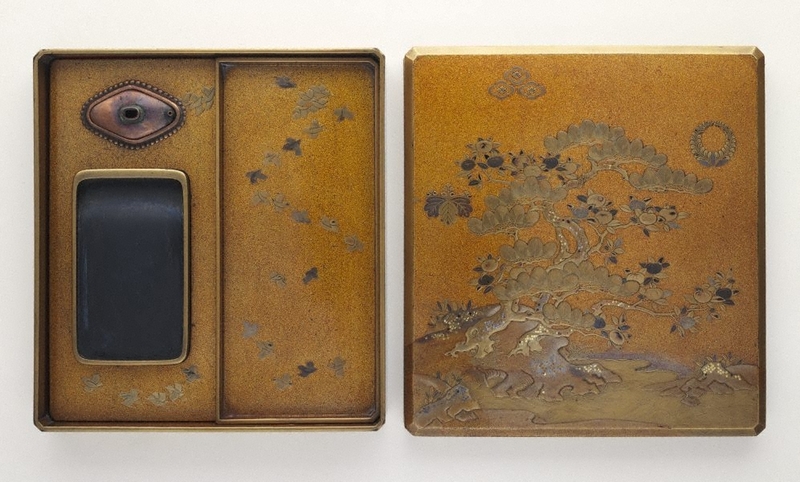 The technique of 'nashiji' involves small flakes of gold of irregular shape and varying sizes being set in an almost random pattern in a bed of wet lacquer. 'Takamaki-e' is a technique in which the design is built up in relief and modelled in a mixture of lacquer and charcoal or clay dust. Art Gallery Handbook, 1999. pg. 272. Bruce James, Art Gallery of New South Wales handbook , 'Asian Collection: East Asia', pg. 246-287, Sydney, 1999, 272 (colour illus.). Art of the Brush - Chinese & Japanese painting calligraphy , Sydney, 1995, 23. Asian Collection Handbook, Art Gallery of New South Wales , 'Japanese Art', pg. 70-82, Sydney, 1990, 78 (colour illus.). The Asian Collections Art Gallery of New South Wales , 'The World of Samurai Culture', Sydney, 2003, 220 (colour illus. ).